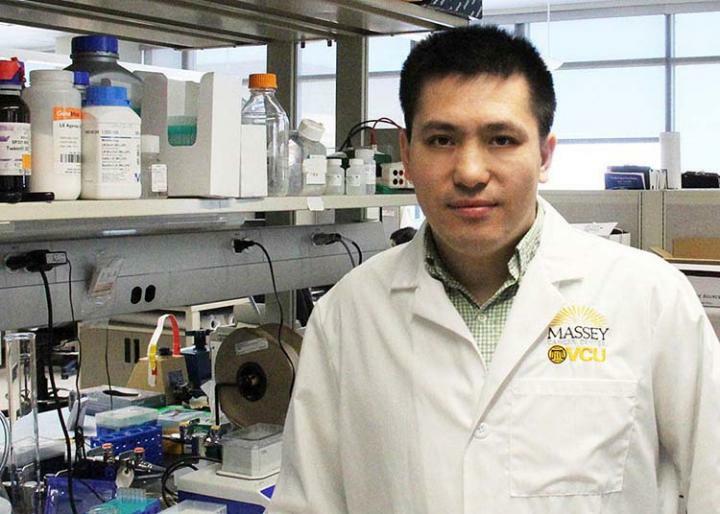 VCU Massey Cancer Center researchers have identified two genes that are responsible for governing the replication of the Epstein-Barr virus, an infection that drives the growth of several types of cancer. The discovery could lead to the development of novel therapies for virus-associated diseases including stomach cancer and lymphomas. Epstein-Barr virus (EBV) is one of the most common viral infections in humans – around 95% of adults carry the virus. EBV infections contribute to nearly 200,000 new cases of cancer and more than 140,000 deaths worldwide per year, according to the U.S. Department of Health and Human Services. EBV-associated cancers include nasopharyngeal (a cancer at the back of the nose and throat), subtypes of stomach cancer, Burkitt's lymphoma and Hodgkin's lymphoma. The life cycle of EBV is divided into latent and lytic phases, where in the latent phase the virus is dormant and in the lytic phase the virus is actively replicating in cells. Renfeng Li, Ph.D., member of the Cancer Molecular Genetics research program at Massey, conducted a study, published in Cell Reports, which determined that the gene PIAS1 is a crucial factor in preventing EBV replication. This is because EBV specifically targets cellular machinery in infected cells to eliminate PIAS1 in order to copy itself efficiently. Typically, EBV exists in the latent phase in tumor cells, however various stimuli can reactivate the virus and catalyze its growth and replication. Once EBV has been activated, it hijacks enzymes responsible for the programmed destruction of cells, referred to as caspases, and then essentially acts like a pair of "molecular scissors" to cut out PIAS1, Li said. The removal of this gene allows for the reactivation and continued replication of the virus. By deliberately blocking this genetic editing, Li found that PIAS1 was able to prevent EBV from replicating within the host. "This finding represents a striking example of an emerging category of virus-host interactions which should offer insights into understanding and controlling viral pathogenesis," said Li, an assistant professor at the VCU School of Dentistry. A second study, published in PLOS Pathogens, furthered the understanding of EBV progression by closely examining interferon regulatory factor 8 (IRF8), a protein that controls the development of blood cells. IRF8 was previously known to serve a major function in a cellular process involved in the reactivation of EBV (B cell differentiation), and this study found that the depletion of IRF8 was directly associated with a decrease in EBV activity. Li's research demonstrated IRF8 directly regulates the activation of caspase enzymes which destroy KAP1, another gene that prohibits the development of the virus much like PIAS1. By suppressing IRF8, Li was able to stabilize the presence of KAP1 to help deactivate EBV in virus-infected cancer cells. "Due to the unique presence of EBV in cancer cells, our research on EBV life cycle regulation by both PIAS1 and IRF8 can help facilitate the development of novel strategies to wipe out cancers associated with this virus," Li said. Li, his research team members Kun Zhang and Dong-Wen Lv and two postdoctoral fellows at VCU have contributed to these two studies.